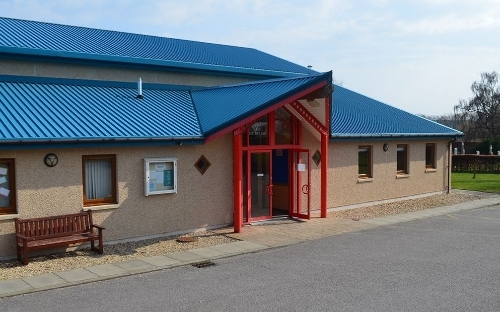 Dyke and District Hall is situated in the centre of the charming village of Dyke, 4 miles West of Forres. It is a purpose-built hall constructed in 2001 following a big community fund raising effort which resulted in a successful application for lottery funding via the 21st Century Halls initiative. It serves the the rural area around Dyke including Brodie, Darnaway, Broom of Moy and Kintessack. The Hall, along with the adjacent primary school and parish church, lies at the very centre of this close-knit community and is very well used and supported by local people. The local Pre-School Centre occupies a purpose-built room in the Hall and there are various clubs including badminton, dancing, bowling and pilates to name but a few. the church and school including concerts, sporting activities, wedding receptions and coffee mornings. The Hall is the local polling place for elections. We were chosen as the entertainment venue during the 6-Day Orienteering Week between 28th July and 4th August 2013.
including a community bar run by Dyke School, a ceilidh, whisky tasting night, family night, traditional music night and an illustrated talk by the Moray Whale & Dolphin Centre. Accommodation comprises a large main hall with a curtained-off stage with tables and seating for approximately 140 people. The floor is marked with badminton courts and badminton equipment and two table tennis tables complete with bats and balls are also available. A section of the main hall can be partitioned off using portable screens. There is a smaller meeting room, a fully equipped kitchen and toilet facilities, including provision for those with disabilities who have easy access to the hall, thanks to a level entrance area at the front.The disabled toilet also includes baby-changing facilities. There is underfloor heating, a pleasant garden area and a large car park right outside. There is a superb children’s play area behind the school across the road from the Hall. There is also a recycling centre located in the car park.